For home re-location and professional transition reasons, I coincidentally found myself in this environment to observe both. 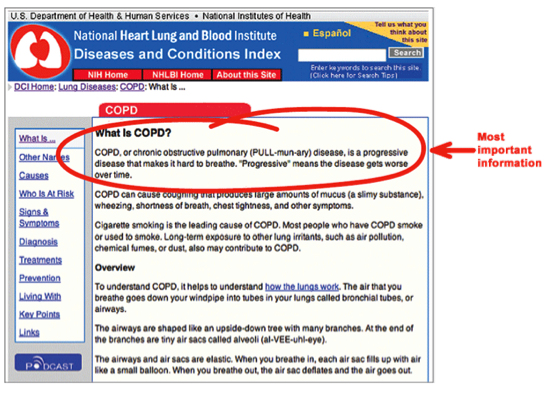 If you visit health.gov, you’ll find thousands of pages of information on how to improve health literacy, much of it describing how to develop more effective websites. Here is an example of ‘effectively presented content on a website’ according to the Office of Disease Prevention and Health Promotion. Is this the solution? Really? We are not trying to beat up on anybody, but we are trying to make a point that seems so obvious, but is obviously overlooked: The job is simply not getting done when it comes to presenting information to people with limited health literacy, which seems to be most of us. 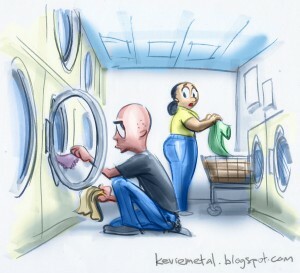 Hence, “Laundromat People” is a useful metaphor reminding us who’s important and at greatest risk. For the most part, those of us who are setting these guidelines and designing the next generation of tools designed to increase preventive behavior and compliance are missing the point. We are the 10% and we are preaching to one another! We “cognitives” are the choir. We are college educated, highly motivated regarding our health, and may even own a Nike+ and take Pilates. We can read charts, graphs, pie charts, dashboards, research papers and complicated web pages. But it’s the 90% who are running up our health care costs, and suffering the effects of poor health decisions! The people I’ve seen in the Laundromat are not likely going to run out and buy Fitbit, Jawbone Up or a Polar Heart Rate monitor, look up their personal online health record or use the VA’s Blue Button. They aren’t going to spend any time on a website like the one I’ve shown here no matter how many experts place the “most important information first” per the recommended guidelines. The Laundromat People are going to keep smoking, gaining weight, suffering mightily, and dying early. We can do better, but we have to create messaging that works, that is easy, almost like the Easy Button made famous in commercials for the office supply store Staples. To hijack a well known phrase, “if we make it really easy, they will use it.” In the meantime, “the cognitives” that comprise vast majority of national and consumer health systems, clinicians, surgeons, informaticists, researchers, policy administrators, and behavioral health providers are talking to the wrong brain when it comes to the Laundromat People. We believe that the easiest approach to influencing behavior is also the oldest: emotive storytelling —or as it is described in the scientific world, the narrative. The emotive path gets people’s attention and draws them in. The story conveys information in a way that provides no reason to argue with the message. We have been designed to learn this way since our inception, to learn by example, through personal mentoring, and through images. Flying solo, we may be able run a coin operated washing machine, but were never meant to learn by ourselves, in isolation.